"Healthy lives free of heart disease and stroke. Together we will make it happen." "Integrity – acting ethically to ensure transparency, accountability and public trust." So how then can one explain the Heart and Stroke Foundation's Health Check program which just last week extended their imprimatur to Harvey's - a Canadian fast food burger joint? 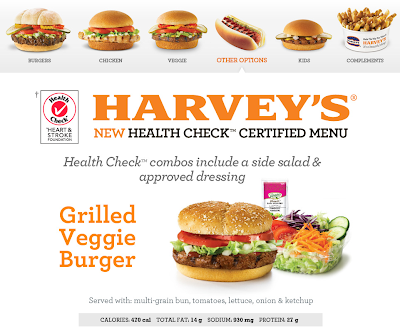 Yup, you can now buy Health Check'ed Harvey's veggie, chicken and regular burgers, where the veggie and chicken burgers contain 930mg and 950mg of sodium respectively (nearly 2/3 of the Heart and Stroke Foundation's daily recommended aim of 1,500mg). And you may as well wash it down with Health Check'ed grape juice containing double the calories and 30% more sugar than Coca-Cola, and why not have some Health Check'ed "fruit gummies" for dessert even though Twizzlers contain less sugar? No self-respecting dietitian or health organization would ever claim that encouraging eating out in restaurants, drinking juices containing 10.5 teaspoons of sugar per glass, and eating faux-fruit candies that contain more sugar than actual candy could possibly be good for living healthy lives. And yet that's exactly what the Heart and Stroke Foundation is actively teaching Canadians with their disgraceful, and nutritionally unethical, Health Check program. 8 in 10 consumers say they can trust Health Check because it comes from the Heart and Stroke Foundation of Canada. 68% of respondents agree with the statement: “I can rely on Health Check to help me make healthy food choices." 64% of those surveyed by Ipsos-Reid indicate they are more likely to purchase a food or beverage from a grocery store if it bears the Health Check logo. According to a report on Food Information Programs published in the Canadian Journal of Dietary Practice and Research (summer 2002), information logos are three times more popular than detailed nutrition information for helping to select between food products. The Health Check symbol reassures consumers that they’ve made a healthy choice. "The Health Check symbol complements mandatory nutrition labelling, in a 2004 research study, sixty-five percent of consumers recognized the Health Check logo as meaning the food is 'nutritious', 'healthy', 'good for you' or 'approved by the Heart and Stroke Foundation." Really? 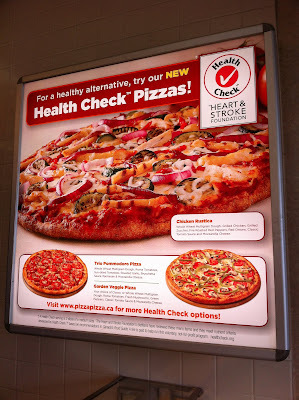 Fast food burgers and pizzas, along with juices and candies that pretend they're fruit are "Nutritious, healthy, and good for you"? Dietitians of Canada (both the organization and individual RDs) - where are you on this? Journalists - how about you? Make your voice heard, or at the very least, consider voting by closing your wallet the next time the Heart and Stroke Foundation comes looking for your support, and when you do, make sure you tell their canvasser why. The Heart and Stroke Foundation, despite the incredible amount of good work that it does, is blatantly and callously misinforming a nation, and it absolutely and undoubtedly knows better and we shouldn't be letting them get away with it. There are no ends that justify these means and how the powers that be at the Heart and Stroke Foundation sleep at night knowing that Health Check is out there and is actively misinforming Canadians is truly beyond me.